If you work in a metal manufacturing company, owning the best metal cutting band saws is crucial. This highly effective tool is designed to cut any types of metals, allowing you to increase your productivity in the long run. Compared to regular saws, a metal cutting band saw is more powerful, durable, and effective. Today, we are going to review the top 9 best metal cutting band saws available in the market today. Since this is an essential investment for you, allow us to introduce the best-selling and durable metal cutting band saws of 2018. 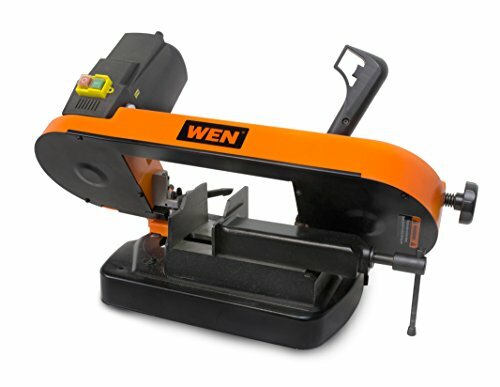 First on the list is the metal cutting band saw from WEN. This model will allow you to adjust the blade speed ranging from 125 to 260 feet per minute. It is compatible with a wide variety of metals. This metal cutting band saw also features a leveling blade that helps to create cuts from 0 to 60 degrees. Furthermore, it can cut pipes up to five inches in diameters or any metal materials up to 5 x 4 inches. Thanks to its compact design, you can easily transport and store the metal cutting band saw anywhere you want. Buyers can enjoy a two-year warranty from the manufacturer upon purchase of the product. We also have the Grizzly metal cutting band saw. The blade included an automatic shut off three cutting speeds and ball bearing construction. The vertical cutting attachment handles and plastic wheels make it easy to transport the item from one place to another. It utilizes motor HP 110V single phase with 1725 RPM max. Its capacity for cutting circular metals is approximately 4-1/2 inch diameter. This metal cutting band saw is lightweight and portable, a must-have tool for anyone who’s working with tons of metal every day. Thanks to its rugged construction, it can withstand regular abuse from the owner and can still serve properly. 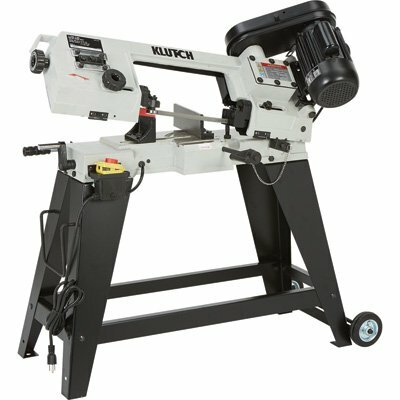 We also have the Klutch horizontal cutting ban saw. It has the capacity of 4 ½ inches round stock and 4 ½ inches in rectangular. Its 64 ½-inch x ½-inch blade can deliver three separate blade speeds ranging from 80 FPM, 120 FPM, and 200 FPM. Thanks to its quick-positioning vise that holds the materials in a great cutting position, using this metal cutting band saw are made easier. It also features a vertical cutting plate, designed for smaller pipes. The package includes a blade and heavy-duty stand. Its variable speed number will allow you to make the most out of the product. It has a safety lock-off gravity feed cutting pressure adjustment as well. 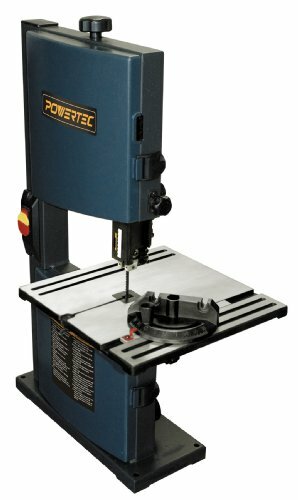 The Generic horizontal, vertical metal cutting band saw utilizes a motor of ¾ HP and 4.8A at 1700 RPM. Its cutting capacity is approximately 4.5 inches for round and 4 inches by 6 inches for rectangular metals. It only has a single phase and specifically designed for horizontal and vertical use. If you are looking for occasional shop use, this one is for you. Albeit not built for a production environment, you get what you pay for this product with its stable and heavy-duty housing. It’s easy to use and sleek-looking, an ideal investment for customers on a budget. The HRT2 metal cutting band saw with red paint job will help you to finish your job faster and inaccuracy. It can cut workpieces for up to 4-inch x 6 inch in a rectangle and 4 ½ inches in the round. Depending on the material that you are planning to cut, you can choose from its three different speed. This metal cutting band saw is designed to cut all types of metal, ranging from brass to aluminum and even alloy. A heavy-duty stand allows you to position the material properly for cutting. Its two wheels are installed and made transferring the metal cutting band saw much more comfortable. Cutting pressure adjustment in a horizontal position has never been more easy with this product! 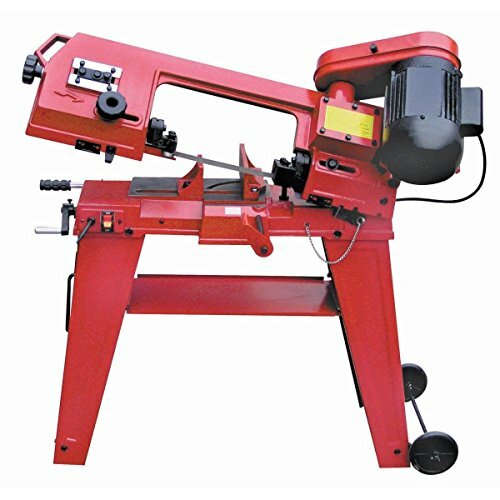 If you are on a budget, you might want to check out the Chicago Electric metal cutting band saw. It utilizes a powerful 10-amp motor with a speed dial that varies from 0 to 420 FPM. Also, it has a 5 in x 5 in deep cut capacity. Thanks to its superior and ergonomic design, you can balance the material properly. It also helps to lessen the fatigue in your hands when you’re working for too long. This metal cutting band saw only weighs 16 pounds. It is by far, one of the lightweight metal cutting band saw in the market. You don’t need caster wheels to carry it anywhere you want. It features bearing blade guides for a precise cut, ideal for workers who need a portable band saw for their projects. 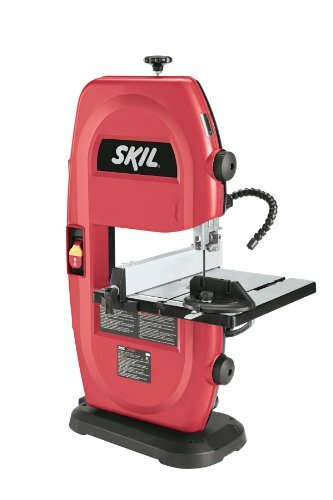 Another budget-friendly band saw we have on our list is the model from SKIL. What this band saw is designed to rip fence for straight and precise cuts. 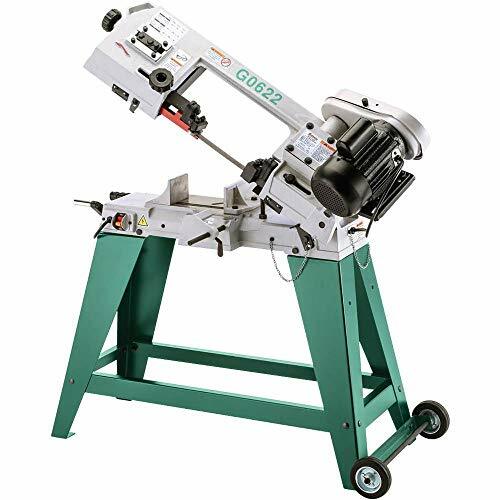 It features a 6-TPI band saw blade that can cut any wood or metal materials. An articulating LED work light is provided, allowing you to work even in dim places. It also features 1-1/2-inch dust port, keeping your working area free from any debris. The band saw has a rack and pinion table adjustment, allowing you to position to the right angle and height adjustment when cutting something. 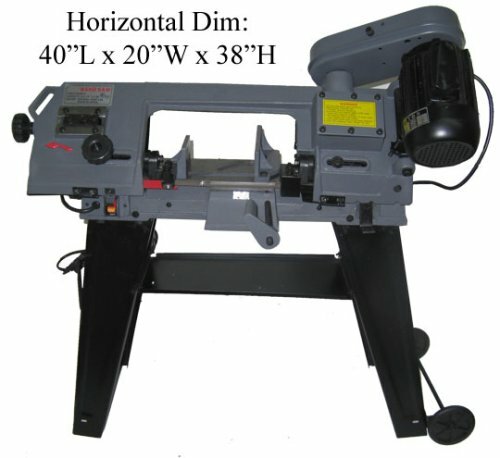 Its motor is number one in speed when it comes to cutting both metal and wood materials, making it a worthy investment. 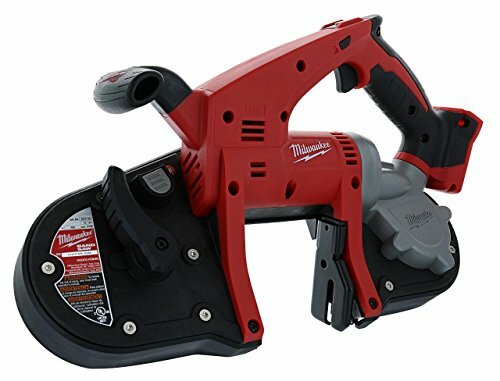 Milwaukee is known for manufacturing high-quality tools and products, and this model is not an exception. Allow us to introduce the M-18 cordless band saw from Milwaukee. This product is easy to use, durable and built to last. Compared to other products, it is 45% lighter. Its compact weight is designed for cutting overhead or in tight places. 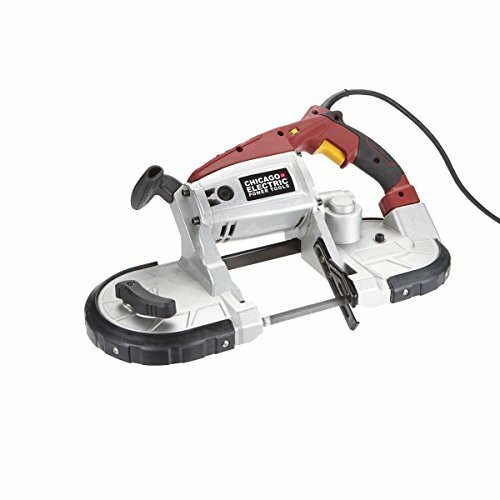 It has three ¼-inch cut capacity, allowing you to work with almost any materials such as metal, pipes, and woods. What this band saw is ideal for mechanical, plumbing, and electrical application. Best of all, you can enjoy this product at an affordable price! For our last item on the list, we have the POWERTEC BS900 band saw. It features a patented blade guard adjustment, allowing you to change the blade with ease. It also features a table with rack and pinion adjustment for easy tilting to the desired angle. This band saw has a blade tracking window and quick release blade tension lever for your convenience. Its blade width ranges from 1/8-inch to 3/8-inch. This band saw offers increased versatility for scroll cutting and resawing. If you don’t have enough budget and is looking for a band saw for occasional use in the shop or house, this is the perfect product for you. Affordable and reliable, the Powertec has it all for you.